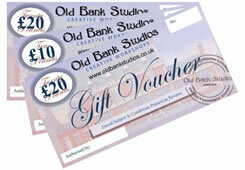 Old Bank Studios specialise in one day workshops in: Art, Textiles and Crafts. We concentrate on providing expert and professional tuition within this ambient setting. The glorious Edwardian banking hall accommodates an art studio, and a smaller textile studio. Each workshop is complemented with home a cooked lunch and refreshments.